Certain factory suspension configurations do not allow the fitment of a stand-alone air spring. In these cases, it is necessary to pair the air spring with the shock absorber to achieve meaningful load capability while maintaining a hassle-free installation. 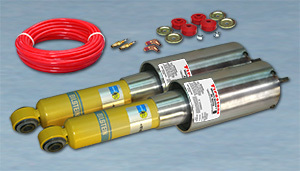 For these applications, Firestone has designed a fully-protected, reversible sleeve air spring and paired it with a high-performance Bilstein monotube shock absorber for perfectly matched performance characteristics over the entire operating spectrum.